Afrin, whose population is predominantly Kurdish, is one of the most stable and secure regions in Syria. With very little international aid, Afrin has taken in so many Syrian refugees in the last five years that its population has doubled to 400,000. Afrin is now surrounded by enemies: Turkish-supported jihadi groups, al Qaeda, and Turkey. Turkish president Recep Tayyip Erdogan has threatened to attack the U.S. military’s Kurdish partners – the Kurdish YPG or People’s Protection Units – with which the US has been allied against ISIS. 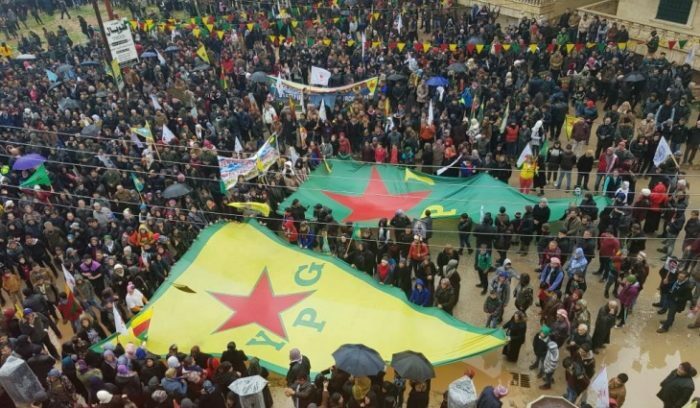 Turkey accuses the YPG of being “terrorists” despite the YPG’s long track record of setting up local democratic governing councils in each of the towns it has liberated from ISIS and its repeated statements that it has no interest in Turkey and wishes to function only as a defense force for Syrian Kurds and other ethnicities living in the Democratic Federation of Northern Syria (DFNS), also known as “Rojava,” which includes Afrin. An attack of this kind against the peaceful citizens of Afrin is a blatant act of aggression against a peaceful and democratically-governed region and population. Turkey cannot carry out such an attack without the approval of Russia, Iran and Syria – and inaction by the U.S. to stop it. The Kurdish people have endured the loss of thousands of young men and women who joined the YPG, and YPJ women’s force, to rid the world of ISIS. The U.S and the international community have a moral obligation to stand behind the Kurdish people now. We call on U.S. officials and the international community to guarantee Afrin’s stability and security and prevent further Turkish aggression from within Syria and across the Syrian border.